Hello everyone. I am Hemant Kr Malani from Kolkata. This year Sudoku Mahabharat (SM) and Puzzle Ramayan (PR) were held in the same month and same venue as last year but there were many changes including the return of Rishi Sir. Moreover, this year on the basis of online rounds base points were added in order to encourage more participation in online rounds. Indian Sudoku Championship (ISC) and Sudoku Mahabharat competition day started at 9:30 am with registration which was followed by the Question & Answer session. Immediately after that the classic Sudoku round began. This round had 12 Classic Sudoku puzzles with 35 minutes. I had planned to make this round good as I was doubtful about the Samurai round. But I could score just 153 out of 400 points; had to do better in coming rounds to make up. Only Rohan could complete the round. This round had 8 variants with a total of 400 points. Except Scattered Sudoku and Skyscrapers Sudoku, I completed other 6 variants. Skyscrapers was easy but I had just 2 minutes on the countdown when I started solving it and was not able to complete. This time again only Rohan was able to finish and got a bonus of 20 points. Then came the Samurai round with one classic and one variant samurai. The classic one was easy and I managed to complete it in less than 20 minutes. But I made some mistake in variant one and could complete only 4 grids. This time Rohan, Kishore, Rishi Sir, Pranav and Gaurav Kumar Jain completed the round with different bonuses. This round was quite different from other three. There were 8 Sudoku Puzzles (4 classic and 4 variants). All of them had at least one number common in each row, column and box; determining which was a part of solving. I completed 5 out of 8. After the round I was told that the Inequality Sudoku could have been completed independent of other sudokus. Anyway, Rohan, Kishore and Rishi sir could finish the round. With this the ISC came to an end with Rohan grabbing the first position. Kishore got the 2nd position and Rishi Sir was 3rd. It was time for the recreation event. It was a one-to-one knock out event where the winner would get the CSM title. Initially there was a knock-out between those having ranks from 23 to 42 and 10 participants were selected from them. Then there was knock out from 32 to 16, from 16 to 8 , from 8 to 4 and then there were semi-finals and finals. Kishore and Rishi Sir reached the finals and the defending champion, Kishore, again gabbed the CSM Title. Next were the playoffs to decide the top three in Sudoku Mahabharat. 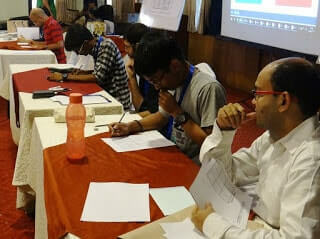 The first playoff was among 3rd, 4th and 5th positions--Jayant, Shaheer and Vishal. Jayant maintained his 3rd position and reached the 2nd stage of playoffs. The next playoff was between Pranav, myself and Jayant. Pranav maintained his first rank and won the Sudoku Mahabharat 2017. I broke the Diagonal Sudoku and became 3rd. Jayant got 2nd place in Sudoku Mahabharat. With this the Day 1 came to an end. Meeting everyone once again, participating in ISC & IPC amd getting selected in Team B for WSC was really an amazing experience. A very big thanks to Prasanna and Rakesh Sir for organizing this event. Also Varun, Kishore, Ashish, Kumaresan Sir, Ravichandran Sir and others from Chennai team must be thanked for their contribution. Thanks to Sumit bhaiya too for the goodies. Looking forward to the World Sudoku Championship 2017 and the next year's ISC too. 1. Sudoku Mahabharat 2015 Finals by Rajesh Kumar: Read about Sudoku Mahabharat 2015 experience by five times Indian Puzzle Champion Rajesh Kumar. 2. 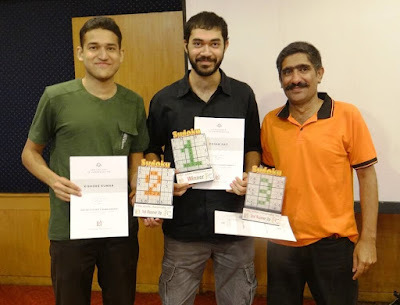 World Puzzle Championship (WSC) 2009 Experience by Harmeet: Read about WSC 2009 by one of experienced Indian Sudoku and Puzzle player Harmeet Singh. 3. World Sudoku Championship 2009 Experience by Gaurav Korde: Gaurav has been one of the best Indian Sudoku player around year 2009. Read his experience attending WSC 2009 in Slovkia. 4. 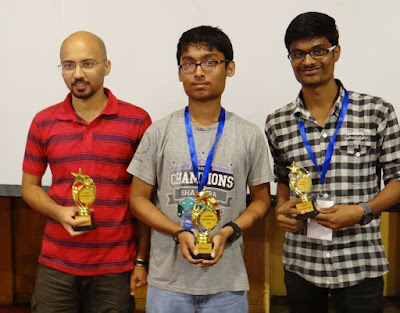 Sudoku Champs 2015: If you can wondering to see some young players in Indian Sudoku Team, then its time to read about Sudoku Champs 2015 which discovered Indian young talent with Sudoku Championships held in different schools across different Indian cities.